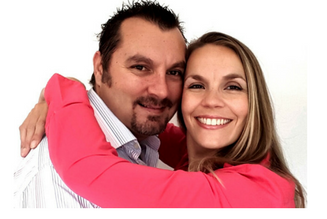 Living in Victory is a ministry started by Byron and Tammie van der Merwe. Byron and Tammie have been married for eleven years and have two beautiful children, Hannah who is nearly four and Joshua who will be one in August 2016. Both growing up in South Africa, Byron and Tammie have been serving the Lord for many years and have been actively involved in local church where ever they have lived. Moving to the London, England in 2008, they belong to Kingsgate Church in Kingston upon Thames, where they currently help lead the prophetic ministry together with the church’s eldership team. Coming from a home maintenance background, Byron never imagined that he would one day be writing books and starting a blog, but God has a sense of humour. He will use anyone who puts up their hand and says yes to the call of God. Byron’s first book “Testimonies of a Good God” was launched in 2016 and Living in Victory was initially started as the platform and point of contact for the book. However God had a bigger picture in mind and this website is slowing growing into a platform for Byron to encourage others, through his newly formed blog, Facebook page and podcasts. Byron is no stranger to struggle and adversity, having lost his sister to cancer and nearly losing his brother three years ago to an illness. Byron is currently in fairly long term battle for his own healing from an injury and illness. But through it all, Byron is even more convinced that God is a good God and that His plans for us are good. In a way ,these struggles have given Byron more of a passion to refresh and encourage other believers who are feeling tired and in need of a practical Biblical perspective on life. We hope that you will join us on this journey of life as we all dig deeper into the word of God and ground ourselves more on the rock that is Jesus.